Android has decisively overtaken iOS as the world’s most popular smartphone platform, both in terms of existing devices and sales, but it seems like usage habits are harder to break. A report out today from Forrester on mobile marketing techniques includes some interesting numbers on app usage, which show that overall, iOS users are still the more avid users across a range of app categories, as well as various smartphone functions. In a survey of 13,000 iPhone users and 15,000 Android users in the U.S., Forrester found that Weather apps remain the most popular category among consumers across both platforms, followed by social networking, navigation/mapping and gaming apps. What’s notable is that in each of the cases, iOS appears to be a more engaged group of users — some 71% of iOS users versus 65% of Android users are checking weather apps regularly; social networking breaks down to 63% and 56%; and mapping is 60% and 52% — but ultimately the platforms are consistent in terms of what is most popular. When it comes to overall smartphone usage, we appear to see the same trend at play across the two platforms. Looking this time at 1,300 iPhone and 3,100 Android owners in Europe, Forrester found that internet browsing is the most popular activity across both, followed by text messaging, app usage, search and social networking. 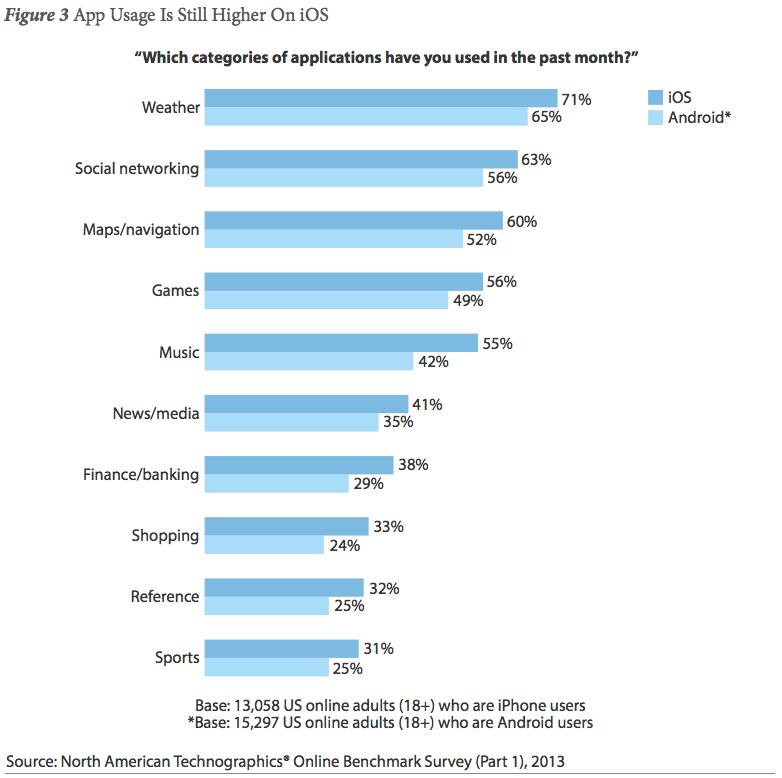 Across all of these, iOS continued to outscore Android in terms of usage. Some 91% of iPhone users say they browsed the internet weekly or more often compared to 80% on Android; in messaging the breakdown was 90% to 83%; and apps were 89% to 76%. Forrester’s report — primarily about the disconnect between consumers and mobile marketers who are misguided in trying to reach them, and what marketers should be doing differently — doesn’t really go into detail to explain why Apple iPhone owners continue to remain more avid users of their devices over Android owners. This is, however, a trend that has been the case for some time now. What these figures do seem to show is that while Android continues to grow in popularity, it has yet to grab that premium class of consumers who use their phones the most and are the most attractive consumers for app makers. That could be because of history — iPhone users were premium, early adopters, whereas Android users are later adopters who may be more price sensitive — or it could point to the iPhone remaining a more user-friendly device overall. In any case, numbers out in May from Distimo seem to indicate another by-product: apps for the iPhone App Store still make more revenues than those on the Google Play store for Android.